Create additional sponsorship revenue at your events and help your exhibitors and brands improve their brand engagement and booth performance with a powerful, no-nonsense, effective medium that puts their brand directly in the hands of the audience. 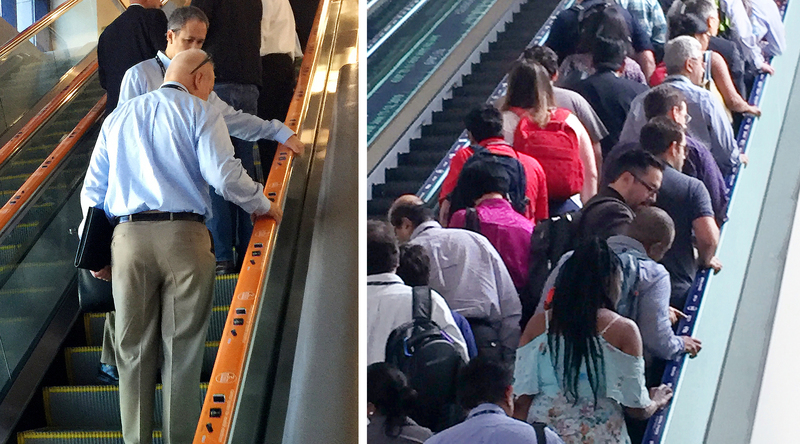 Escalator handrails are highly visible and unique because the brand message, booth #’s, or calls to action move with the audience as they ride the escalators multiple times per day as it transports and funnels the audience between floors during the events. Add to this, the duration of time the viewer is riding the escalators and we are talking about brand recall gold and increased booth traffic! Skip the popcorn vending machines and other frivolous items that don’t drive traffic to your booth or align with the brand. Dominate your brand presence effectively. Imagine this kind of attention to your brand?